Inspired by the heart chakra, Crysten Nesseth welds her stunning garden ornaments. It is believed in certain Hindi traditions that your true self can be found in the cave of your heart. Inspired by this powerful anahata, or heart chakra, Crysten Nesseth welds her stunning garden ornaments. 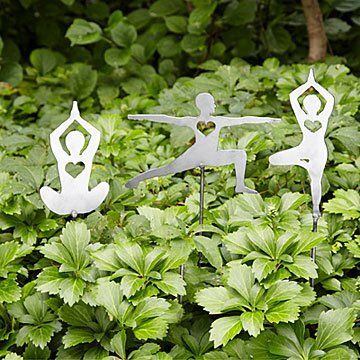 The recycled steel stakes are formed into three asanas: Tree, warrior, and lotus pose, complete with a heart in the center to represent the anahata. Placed among your peonies or tomato vines, the mindful yogis invite you to remember the connection between body, mind, and soul. Handmade in Wisconsin. Science and the beauty of the natural world are some of the things that spark creativity in Crysten Nesseth. At St. Olaf College in Minnesota, Crysten received a degree in Biology, but while studying about organisms and molecules, she discovered another great passion: metalworking. Since graduating college, she’s been honing her sculptural craft, designing everything from complex seahorses and dragons to spiritual and yogic pieces. When she’s not welding her unique sculptures, you can find her rock climbing, scuba diving, and travelling to new inspirational places. Stakes will develop a natural patina if exposed to moisture. If desired, apply a clear lacquer to protect. Absolutely would buy them again! My friend has placed them in her garden at the entrance to her new home studio. She was so excited to receive them. They are unlike anything she has seen, especially since opening the yoga studio. Material is cheap & was not packaged in a manner that would protect it from being damaged. Not packing material of any kind inside the cardboard box. My mother in law put it in her flower garden. Great for the garden. Perfect Hanukkah gift!